Wash and chop mushrooms in desired shape. Heat 1 tbsp oil and stir fry mushrooms for 2-3 minutes. Remove from pan and keep aside. Heat 1 tbsp oil in the same pan and crackle cumin seeds then add onions, ginger, garlic and green chilies and cook till the onions start changing color. Now add salt and turmeric powder and mix well. Now add rest of the ingredients except mushrooms and mix well. Cook further till all the water present evaporates. 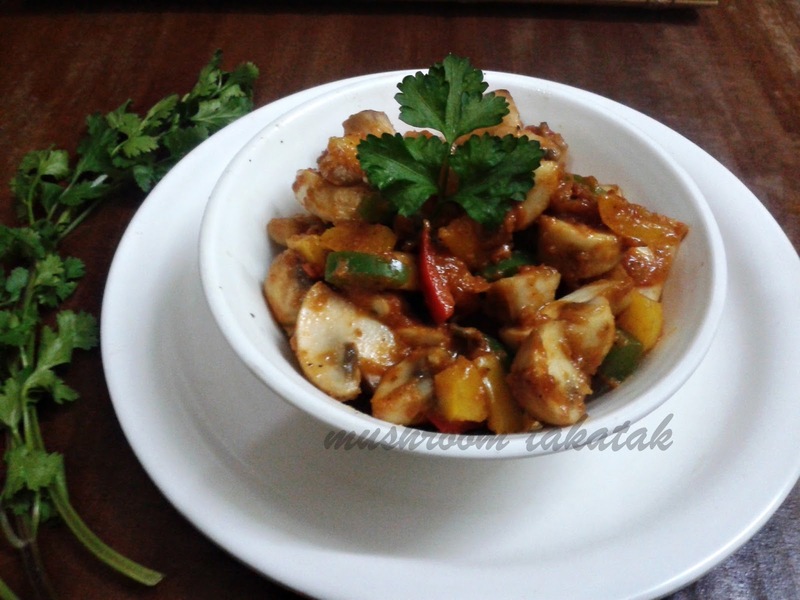 Add stir fried mushrooms and mix gently till the masala coats the mushrooms well. Sprinkle chopped coriander and mix well, serve hot with daal and chapati or paranta or poori or you can serve it as a snack as it is served in wedding reception parties.